This past weekend the kids were sick and we needed to clean the house for our upcoming homeschool coop at our house. I thought it was the perfect opportunity to do a little organizing of my scrapbook supplies. 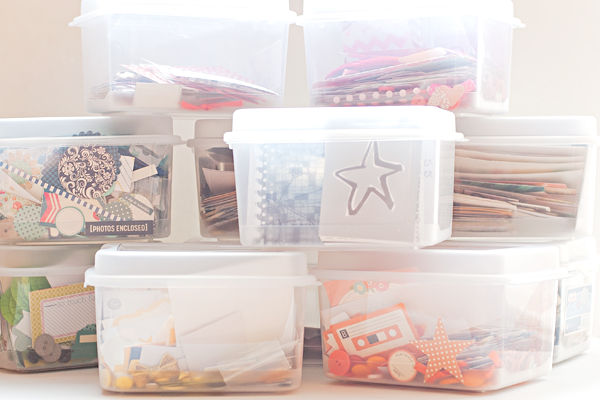 I had had my Project Life cards organized by color, but all my embellishments were just thrown into a big bucket. This made it really difficult to find things that I wanted to use and therefore they just sat in the bucket and never got used. I decided it was time to organize the embellishments by color too. I picked up the Sterilite Small Flip Top Storage Box, Pack of 12 . These cases fit the 6"x4" cards so perfectly along the side of the container. I split up all the cards again by color. This was easy since they were already in rainbow order. I then grabbed all my elements and dumped them out on the floor and went through them one by one to put them in the right container. My black/white/grey cards are all in one container and the elements in another container. All the other colors of the rainbow ended up having one container with all the cards and elements together. NOTE: When I receive sticker sheets, except for alphabets, I cut out each sticker leaving the back in-tact. I like doing this for easy storage and it makes it easier to sort everything by color. I ended up with one container each for pink, red, orange, yellow, green, blue, purple, brown/tan, multi-colored, and two containers for the black/white/grey cards and embellishments. The only exception to all of this is the Christmas themed cards and embellishments. I have those all in a large zip-lock bag and they are stored away in a large tote bag with the album and other things I have set aside for my December Daily album. 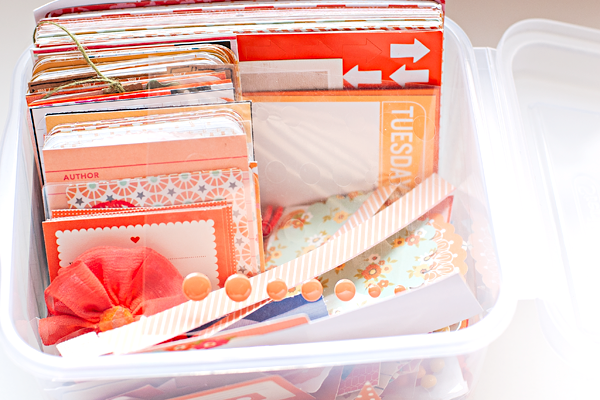 How do you organize your scrapbook supplies? Do you sort by color, or do you keep your kits together? I love seeing how different everyone organizes their supplies according to what works best for them! Disclosure: This post contains affiliate links. I will receive a small commission on purchases made, using my link. This helps to keep the site up and running and for me to purchase supplies needed for the tutorials and freebies I offer. Thank you for your continued support!